Soft and pliable, Easy for wrists. Spark resistance, Durable. 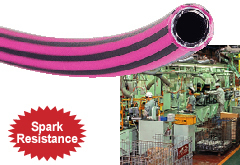 Spark resistance is better than the polyurethane hose. The hose is soft and pliable, which reduces stress on wrists and arms.